As many of our readers will know, Iceland and its spectacular volcanoes have been in the news again. This time it is not Eyjafjallajökull, but the Grímsvötn volcano. 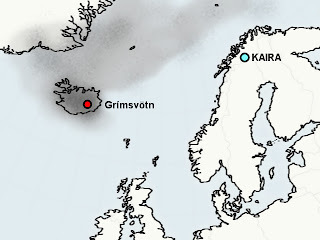 Although there have been some recent volcanic activity from Grímsvötn (1998 and 2004), this recent event is much greater. The eruption, which began on 21st May 2011, is reported as being the largest from that particular volcano in over 100 years. There have been many reports about this, including some spectacular photographs, made in the general press. As might be expected, there is a lot of interest in the event due to the disruption that Eyjafjallajökull caused last year to air traffic. There is also the question as to whether any effect would be noticed from Kilpisjärvi. 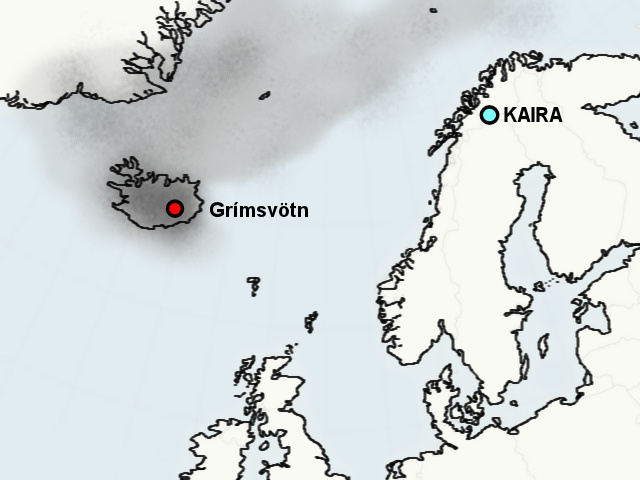 However, predictions at the moment suggest that the bulk of the ash cloud will move to the north, and should be well clear of the KAIRA site.